Viva Senior Sto. Niño! There shout the Sinulog Mardi Gras dancers - A common, loud and strong hurrah during every Sinulog season here in the beautiful island of Cebu. Sinulog Festival is a unique and dubbed as the mother of all festivities here in our country, the Philippines thus each year, a grand Sinulog Festival is being prepared by Cebuanos for locals and especially to our beloved brothers , sisters and family who are coming home just to celebrate Sinulog and of course, honour our dear Santo Niño. For two years, FaceCebu.net (FC) supports the Sinulog Festival by updating its readers and followers with news and other statuses of the fete. This year, FC would love to provide guides and tips to Cebuanos and travellers for easy and memorable Sinulog experience – thus everybody would really feel that ITS MORE FUN IN CEBU, PHILIPPINES! These tips are based on personal experience by the author and proven effective for everybody. Never top yourself with long-sleeved polos or thick cotton shirts which for sure give you a hassle way of moving around. Wear thin shirts – white tee will do. Don’t wear jeans! Shorts but not too short shorts will give you ease in walking and for sure, your body can freely breathe out. No, no to heavy type shoes, espadrilles are good! If you like, wear flip-flops or any slippers that fit the festivity. Lastly, do not wear jewelleries. Leave all your shining borloloys at home. Be simple! A backpack which is not too big or small is cool. Just bring finger foods for snacks, enough water for oneself to be well hydrated and of course money put in a coin purse – not in a bulgy wallet! We are there to enjoy, not attracting pickpocketers and other evil forces around us. Note that foods, drinks and other stuffs will get higher on that day, so better prepare and bring your own. Prepare extra t-shirt and a face towel. We never predict what could be the weather, so be prepared. 3. Where to go? Prepare your Sinulog Map! Know your destination during the Sinulog festival! You cannot travel and visit all the beautiful places in town, just choose where to go and stick to it. In this way, you won’t be adding to the number of devotees who actually don’t have plans where exactly to go as a result, adding pressure to a heavier traffic not caused by transpos but of those people. 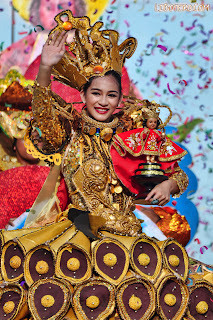 Check the list of Sinulog Events and decide prior or before the day. Don’t go alone. Sinulog can be enjoyed with lots of company, as a commercial saying goes the Many-er, the merrier! Enjoy the Festivity folks! Should you have other comments and suggestions how to enjoy the festival, feel free to comment below.